The Power of Agreement and Multiplication… Onward Christian Soldiers!!! What we see in this video is OUR history and these sacrifices that were made, starting with the American Revolution and in ALL the wars since, have been fought to maintain our liberty. Let us not ever take these sacrifices for granted, and certainly let us not allow our own political leadership, under this de facto DC Corporation, to strip our liberties from us! In light of everything that is going on within our country today it is more than obvious that our nation is in serious trouble. The reason we are in trouble is because Christians within our nation have NOT been taking care of business; and what’s worse we have long ago abdicated our rightful position, as God instructed, to bring God’s Kingdom into the earth, as it is in heaven. We can’t do that unless we are actively involved both in our government and in the marketplace; however having limited ourselves to solely religious activities within a four walled building once or twice a week, we have grossly limited the impact which God intends us to have in this world. Instead of us charging the gates the hell, quite the opposite has happened, and it’s all because of the church’s weakened posture and presence within both our culture and our society at large, where instead of being on the offensive, the church for the last 100 or more years has been in a steady state of retreat. This is due in no small part to the fact that most denominational churches today have all but denied the POWER of God, as scripture said would happen in the last days (see 2 Timothy 3:5), and by power I mean they have relegated the Gifts of the Spirit and the signs and wonders as having long ago ceased. My quesiton is, have we accomplished our Great Commission; have we charged the gates of hell and have we relegated Satan powerless? The answer is no, obviously not! Quite the contrary, instead with every advancement the enemy has made over the last many years, such as when abortion, which is infanticide, when it became the law of our land, all the church did was draw another line in the sand and back up; and we being doing nothing but backing up ever since. Not only do we NOT have Satan on the run, it is we, the church, who has been running from him! The Gifts of the Spirit and the POWER of God to work signs and wonders in the earth are the tools which God has given us to do the work which He has called us to do! I mean this is not rocket science here… it should be common sense! For the church to even attempt to go to war and do battle in Jesus name without these tools in hand is like sending our troops to war with only their bare hands to fight with, against all the armored vehicles and munitions of our enemy. We would never do that, and neither would God! 3-6 The world is unprincipled. It’s dog-eat-dog out there! The world doesn’t fight fair. But we don’t live or fight our battles that way—never have and never will. I ask you, is this scripture still not true today, and so has the need for these spiritual weapons ceased? Of course not! Obviously not, and the fact that the church has not availed themselves of these spiritual weapons and has instead adopted the world’s methods and means to do God’s work is more than obvious by the dismal results we have to show for our efforts today, at least in this country. Today in the United States, under this defacto (unconstitutional and therefore unlawful) Corporate system, we the church are most definitely unequally yoked. 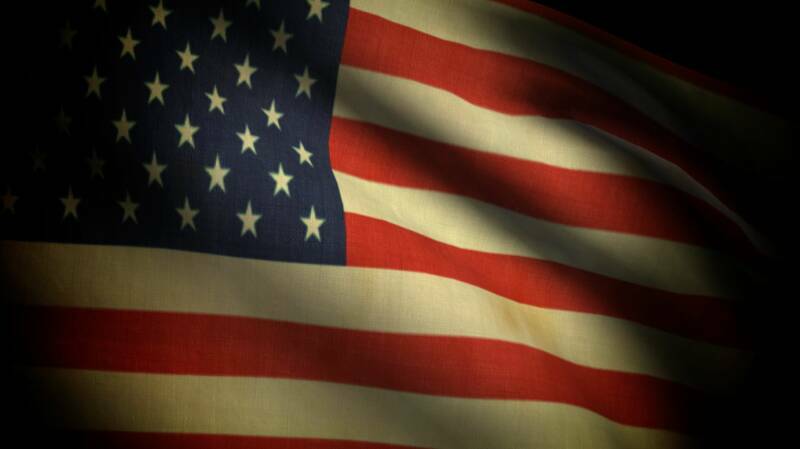 It is the unbelievers, the pagans, and worse (for the most part) who have been running this country for the last 140 years, ever since the Act of 1871 was passed, and our Republic and our organic Constitution was mothballed and made inactive. None of this was done through proper channels or means, as outlined in our organic Constitution, and so in terms of the LAW, with the highest law being our organic U.S. Constitution, all of these actions are null and void out the gate; but because of the fact it was done surreptitiously behind closed doors, in the same way business is largely done today, under this de facto Corporate system in D.C., the general public was non the wiser and just accepted it… just like we see happening today. Whatever this defacto Corporation in Washington D.C. does and however they decide to do it, we may complain, but we accept it. We did it when the Patriot Act was passed and our Constitutional protection against unlawful search and seizure was thrown out the window; we did it when Obama sign the National Defense Authorization Act (NDAA) into law, and our constitutional rights against unlawful detention where thrown out; and we did it when Obamacare was pushed through Congress, with no debate or public discussion on it’s merits, and Congress didn’t even bother reading the Bill before they voted it through, no less!!! Folks, what is wrong with this picture; and what is wrong with the people of this country that we are just sitting back and allowing these politicians to strip our rights from us like this? It’s like we’re drinking the government issued “politically correct” kool aide, as if we don’t have minds or discernment of our own, to see what is happening to our country… as this present lot in Washington DC is taking us all down the tubes! Thanks to these people today, our nation is in the exact same position as Rome once was, when the people of that age also thought that they were too big to fail. Their failure and their ultimate demise came about, not from any external enemy, but it came from within, through the greed, corruption, and lack of morality of its own leadership; and if we aren’t careful, and if we fail to wake up and respond, then that same history is about to repeat itself once again here in our country! So what do we do… what can we do? This is definitely NOT the church that Jesus began over 2000 years ago that turned the world of its day on its ear; and we obviously today are not on the offensive, charging against the gates of hell either! Not at all, quite the contrary they have had us in retreat for the last 140 years or more. So then what can we do? We who are believers are grossly outnumbered, out manned, out gunned, and we are not in control of this de facto corporation. Their strings are being pulled by people that are above them; by the same people that Jesus angrily chased from the temple, the Money Changers and Bankers of His day… well they are still around and they have only grown in power. This is where we have to begin, as this war can never be won in our own strength! Fortunately, as we begin to learn to use God’s spiritual weaponry, as Paul instructed us to do in 2 Corinthians 10, then we will see the tables turned, just as it happened with our founding fathers, when they also were sorely out numbered and out manned. Then as we look to Deuteronomy 32:30, we find that if ONE can put 1,000 to flight and TWO can put 10,000 to flight, where with the addition of each prayer warrior the odds increase by a factor of 10, then it naturally follows that if more of us would just come together in agreement and pray, we too could turn our world on its ear! This is where it ALL begins, with our repentance and our submission to God and to His ways. I believe this is also God’s strategy and plan for us in these last days, to do just that… but we have to start by praying and through our intercession, and our doing spiritual battle against these wicked and evil principalities and forces of Satan (and of darkness) who are actively seeking to establish their kingdom in the earth, their “New World Order,” who today are also controlling this de facto Corporate system in Washington DC! 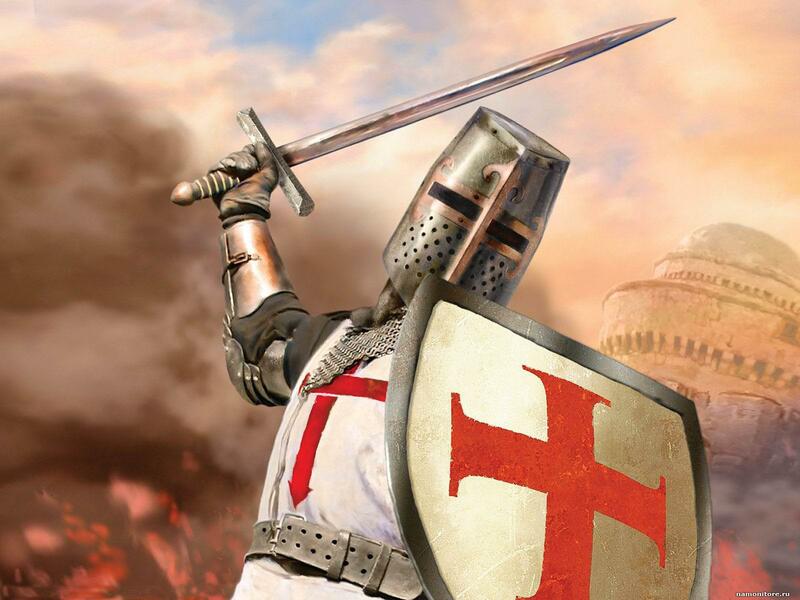 They are already defeated, ever since Calvary, and the only way they have been maintaining control over this world and over our country is because the church has not been on the job. It is WE, the church, who are to be God’s occupational force in the world, until Jesus returns! 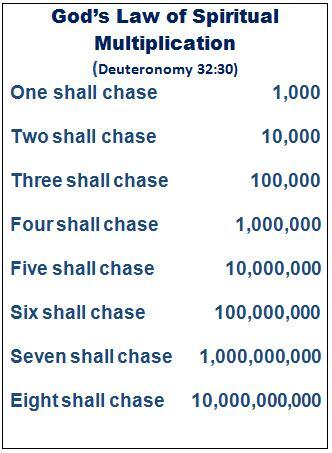 Here is God’s multiplication table and how these numbers can easily translate in our favor, in order for us to accomplish our mission in the earth. We definitely have the advantage, but we have to fight God’s way, using His strategy, His Power, and His tools! I believe this world is about to witness the BIGGEST revival this world has ever seen, which will be the last stand God makes before this dispensation, this age of the gentiles terminates, which will happen just before Jesus comes back to earth and sets up His throne in Jerusalem. All of this, I believe, is going to happen within our lifetime, meaning soon and very soon! Author SPARKS FROM THE ANVIL OF LIFEPosted on April 17, 2013 April 17, 2013 Categories Political Commentary, Spiritual Rhema... Sparks from the Anvil! Previous Previous post: Sounding the alarm for these last days…. let us all be mindful and listen to what the Spirit is saying to the church today!